Things are picking up. Over the last few months we continue to be limited to flying within Uganda only. We are making good headway into getting our certification back and with it the ability to resume flights into South Sudan and East Congo. At this point we are coming up on one year since everything changed, but as time has passed there has been some positive things happening within Uganda itself. We have increased the number of shuttle flying within Uganda, and we now fly shuttle flights every day of the week. Initially the number of passengers that were booking flights on the Tuesdays and Thursdays was quite low, as they have gone for years without flights on those days, but that number has picked up quickly as they have realized that they now have the ability to be flown on any day of the week. As the amount of flying has picked up, we have also split the country into two shuttles, one serving the western portion of the country and one serving the eastern portion. We are also anticipating the re-opening of an airstrip in a village called Adjumani, a small village in northern Uganda that has become home to over 100,000 South Sudanese refugees. As the missions and NGO's in the area have come in to work with the refugee camps, the need to re-open that airstrip has become very apparent and the agencies there are working on the repairs needed to make the airstrip useable again. Once that happens we could see a lot of flights going into that area on an almost daily basis. Only time will tell. So things are moving on. Flying was picking up and we are getting closer to getting our certification back. Then the earth moved. The earthquake in Nepal sent many relief agencies running for the Himalayas to help out with the crisis there. MAF was not certain that there was a place in Nepal for us, so they initially sent in a couple people from the MAF disaster response team to do an assessment of the need that existed in Nepal. 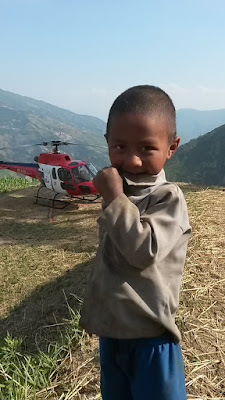 After spending a couple of days there talking to different agencies and various people on the ground, it was decided that MAF would partner with a local helicopter operator, Fishtail Air, and facilitate a helicopter response to the needs in Nepal. One morning when I was in the MAF Uganda office, our program manager came into the room and asked if any of us pilots would be willing to go to Nepal if the need arose and we were asked to send someone there to help out. Pilots being pilots, we all indicated our willingness to go. Several days later one of our pilots who has been involved with several disaster responses in the past left to go and help out the Nepal team. He hit the ground running, and they were working 20-22 hour days for the first several weeks that they were there. I figured that the door had closed for any opportunity that may have been there for me to go, and I focused on the work at hand in Uganda. Then, one night just as I was finishing my supper, the phone rang. It was our program manager, asking me if I was still interested in volunteering to go to Nepal to work with the disaster response team there. This time I didn't respond immediately. There were a few other factors in play that I needed to consider and discuss before giving an answer. The biggest one being that my younger brother is getting married on the 13th of June, and I had been planning to attend his wedding. My flight was booked and the days were marked off from work so that I could go and be there for that. Even though it was to be a whirlwind trip, I was looking forward to watching my brother marry his sweetheart and spending a couple of days back in Canada with my family, maybe even getting in a round of golf. In a heartbeat all of that changed. I hung up and told Karen and the kids what that call was about. After a minute of gathering our thoughts, discussion was had. We decided that we needed to involve my brother and parents in this discussion as well, and for the next couple of hours my phone was smoking as phone calls traveled at the speed of light between Africa and Canada. After some good conversations, prayer and thought, we decided that I would cancel my trip to Canada and instead fly off to Nepal and help out there. So here I am. Sitting here typing within eyesight of Mt Everest. Out of all the people in all of MAF, why me? Chock up one more thing on my list of things that I never would have ever ever dreamed that I would ever ever do. God has been working in Karen and my hearts lately, challenging us to trust Him more and to hold our own plans and possessions with open hands. It's not easy. What is easy is for us to say no. Even slowing down to think about it, pray about it and consider it when it feels as though what we are being asked to do is so far outside our capabilities takes an intentional effort. Looking back and remembering the faithfulness of God and how He has shown Himself to be faithful to us is an encouragement to us. Even looking back to re-read blog entries from previous years is a blessing and encouragement. Holding our plans with hands open is a large part of why, two days ago on my birthday, I was able to join a flight and see some of the front-line work that is going on in the remote mountain villages. It was an incredible blessing to see the medical work that is going on in that village. The destruction is beyond belief in the mountains. Villages laid flat when the earth moved. Monsoon season is within a few days of beginning. The future is uncertain for so many of the people. But God is moving, showing Himself to be faithful through the actions of His people and the love that they are showing to the people around them. But now I need to go. One of the office chairs had a wheel break off and I need to run into downtown Kathmandu to find a replacement office chair wheel. There's a sentence that I never thought I'd write. Some days are glamorous. Some days I go shopping for office chair wheels. God's love in action in so many ways, some big, some small. Thank you for your prayers.